Pre-1990 many products containing Asbestos were used in construction. It can be found in vermiculite, insulations, pipe wrap and boiler insulation, cement pipe, textured ceilings, wallboard and siding, flooring (adhesives), in drywall mud/joint filler, roofing shingles, artificial fire logs, gaskets and a wide range of other materials. If Asbestos-containing materials are in good condition and left intact, they do not pose a significant risk of releasing Asbestos fibres into the air. However, these materials are hazardous when they deteriorate of if they are disturbed (for example, when they are handled, sanded, drilled into or broken up so that they crumble). Asbestos fibres are very fine and can stay in the air for hours. Breathing in Asbestos fibres may cause serious lung problems, including lung diseases or cancer. The Regional Landfill, located at 1105 Cedar Road, Nanaimo, accepts asbestos waste for disposal only from the Regional District of Nanaimo or North Cowichan Regional District on an appointment basis on Tuesdays and Fridays. Call the Regional Landfill at 250-722-2044 extension 3221. There is a legal requirement that waste Asbestos be double-bagged in 6 mil (12 mil total) poly or approved asbestos bags (available at safety supply stores). The Landfill scale house provides Asbestos bags suitable for disposal at a cost of $2.00 per bag. Each bag must be packed so that it can easily be lifted with one hand to shoulder height. 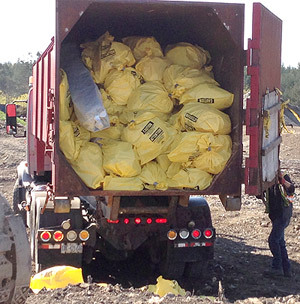 As a homeowner you can take your own waste Asbestos to the Regional Landfill as long as the load is properly bagged and sealed and weighs less than 1000 kg. Multiple load volumes must not exceed this limit in a 30 day period. Twist tightly the unused top portion of the bag into a tail and seal with duct tape at the base of the tail. Place the first bag in the second bag, and repeat the sealing procedure. Commercial customers must follow Asbestos Hauling and Disposal regulations as set forth by the Ministry of Environment and WorkSafe BC. Residential customers must read and adhere to WorkSafe BC's requirements for Asbestos handling and disposal, and the Ministry of Environments regulations for transporting Asbestos containing materials. Customers should note the requirements change depending on the type of Asbestos being remediated. Asbestos is not accepted at the Church Road Transfer Station. Contact the Regional Landfill, 1-250-722-2044 extension 3221, to schedule an appointment for disposal. The Church Road Transfer Station, located at 860 Church Road, Parksville, does accept Drywall (Gypsum) for recycle drop off. Drywall (Gypsum), installed from 1990 or older, has been identified as a suspect Asbestos containing product. The drywall or the joint filler compounds used may contain Asbestos. Drywall arriving at the CRTS site must have multiple date stamps throughout the load. One date identifier is insufficient to allow for material drop off. Date Stamps must be clearly legible and must be dated January 1, 1991, or newer and are located on the back of a sheet of drywall. Materials date stamped December 31, 1990 or older are unacceptable without lab analysis proving no Asbestos contamination. Other acceptable identifiers include bar codes or printed web addresses. Either of these identifiers confirms the drywall's acceptability for recycling by New West Gypsum recyclers. The customer is responsible to produce the acceptable identifiers to transfer station staff to verify acceptance of the drywall. If there is no date stamps, barcodes, or web addresses present, customers may seek certified lab analysis to prove the material is free from Asbestos contamination. Customers may present an original copy within 30 days of the cleared lab analysis to the CRTS Scale. With staff approval customers may dispose of the Drywall/Gypsum in the Transfer Building. Drywall disposal rates will apply. Unless otherwise proven through certified laboratory testing or evident from examination by trained staff, Drywall from renovations or demolitions will be considered pre-1990 and Asbestos handling procedures must be followed. Customers are recommended to contact the Transfer Station Supervisor, 250-248-5254 Ext 2100 or Transfer Station scale house, 250-248-5254 Ext.2104 prior to any demolition. Suspect Asbestos contaminated drywall will be placed in two 6mil Asbestos disposal bags. To properly seal disposal bags with pre-1990 drywall follow the Asbestos Handling procedure for Homeowners. Why are two 6mil bags required? Work Safe BC has identified that sealing suspect Asbestos containing drywall in a bag with a minimum thickness of 12mil offers the best protection from airborne Asbestos fibers. The Church Road Transfer Station and the Regional Landfill offer 6mil Asbestos bags for sale at a cost of $2.00 per bag. It is recommended that a form of heavy duty tape be used to seal the bag. Bags will not be accepted for disposal at the Regional Landfill unless they are the minimum thickness of 12 mil and have been correctly sealed. No bagging of material will be permitted on-site. www.cmhc.ca On the web site, search for "asbestos". Web site: www.hc-sc.gc.ca On the web site, look for "asbestos" and "vermiculite" in the A-Z index.